We give away free books here at NewLDSfiction.com! 1. Read the Fine Print below. 2. Use the Rafflecopter form on the giveaway page to earn entries. 3. You may earn entries every day. 4. Winners will be chosen at random at the end of the month. 5. Sponsors will send books straight to the winner. During the months when we are not hosting a reading challenge, NewLDSfiction.com will host a giveaway where you may enter to win a copy of the books posted under the heading “Win These Books!” on the NewLDSfiction.com sidebar. Prizes are print or e-books to be provided and sent directly to the winner by the Prize Sponsor (the author or publisher of the book). To enter to win one of the books shown in the sidebar, use the Rafflecopter form on the giveaway post. (See big green button in sidebar.) NO PURCHASE NECESSARY. You must be 18 years of age or older to enter OR have parental permission. Due to differences in international sweepstakes laws, print book prizes are limited to U.S. residents. (Or may be gifted to someone with a U.S. mailing address.) E-book prizes are open to anyone with an email address. Details on how to earn entries are explained on the Rafflecopter form. Winners will be chosen at random on the first business day of the new month, or as soon thereafter as possible, using Rafflecopter’s random selection. There shall be one winner per book. Eligible entry is defined as an entry that correctly follows the instructions. Entries that have incomplete information or links that do not work will be disqualified. 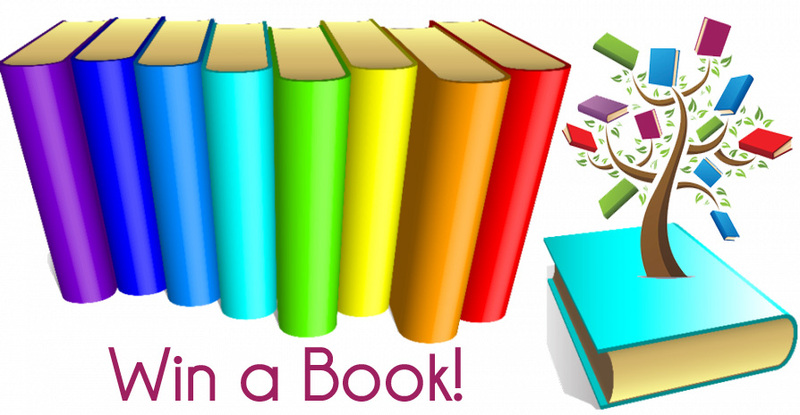 To increase your odds of winning: when listing the book(s) you would like to win, make sure you choose a format that it is offered; the more books you list in option 1, the more likely you are to win something; more entries give you more chances to win. Each new month begins a new giveaway. Since each month’s contest winner is randomly selected, it is possible that the same person could win a prize in consecutive months. Winning names will be displayed on the Rafflecopter widget on the first business day of the new month, or as soon thereafter as possible. Winners will also be notified via the email address they used in the Rafflecopter form. Winners must respond to the notification email within two weeks of the close of the Rafflecopter or they will forfeit their prize. If winner forfeits or does not claim the prize, prize may or may not be re-awarded, at the discretion of the Prize Sponsor. Email addresses will not be posted, used, or shared in any way, except for purposes of awarding the prize. Winner’s email address shall be forwarded to the Prize Sponsor with instructions for them to delete it upon shipping the book. Winner information will also be maintained in a database should any question or dispute arise at a later date. All other information collected will be purged within two weeks of announcing winners of the sweepstakes. All prizes are gifts from the Prize Sponsor, not from NewLDSfiction.com. Prizes are shipped directly to the winner by the Prize Sponsor. Therefore, NewLDSfiction.com shall not be held responsible for errors made by Prize Sponsors, including but not limited to delayed, damaged or lost shipments, failure to award prize as promised, or misuse of information (name, mailing address, email) by the Prize Sponsor. NewLDSfiction.com and Prize Sponsors undertake this sweepstakes in good faith, and therefore shall not be held responsible for any and all errors which may occur during the conduct of the sweepstakes, including but not limited to technical failures which may or may not effect the entry process; technical or other errors which delay or prevent communication with winners in a timely manner; typographical or other errors; or any other human error which may effect the outcome winner selection. NewLDSfiction.com and Prize Sponsors shall be held harmless in the event that the prize or the sweepstakes in some way negatively impacts the winner and/or entrants. Click here to offer your book as a prize in a giveaway. Would love to have one of these books. I would love ❤️ to win a book to read! Thank you so much! Reading opens you heart and mind!